When you think of an undercover officer wearing a covert body wire, you think about a box with a long wire and covert microphones taped to the personÃ­s back or chest. 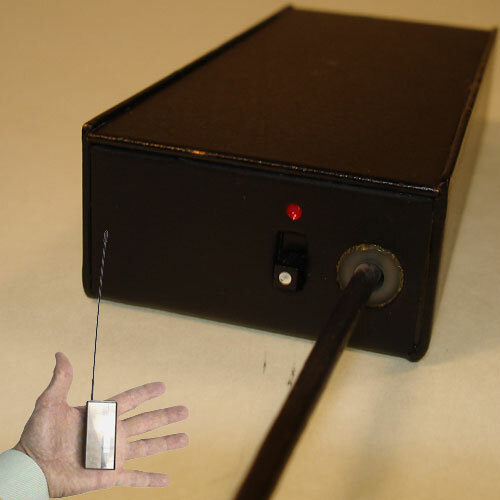 Our radio frequency transmitter is a self contained body wire built into a small box with an antenna that can sit in the inside of your jacket pocket, shirt pocket, purse or back pack, and be able to hear what is being said in a face to face conversation. Covert body wires are meant to be worn as body wire packs, yet a new trend observed is the placement of our covert body wires in rooms. Our body wires can be hidden under tables, couches, behind book cases, left in conference rooms and lobbies, and many other places one would deploy a disguised transmitter. They are still used for body worn surveillance operations yet the added feature is to use them as a room transmitter. The G1415 consists of a body wire that is body worn and functions as an audio transmitter used to monitor conversations. G1415 Body Wire packs can work with one or more audio receivers for multiple listening applications.